Something simple to strive for: live a year where you never let a birthday slip by without a celebration. You already know I am not much of a cake person, but somehow I have become the birthday cake baker of my French family. It originates from a lack of what I used to call "real birthday cakes" in French bakeries. You know, a simple layered and frosted sponge cake. You can't find them here. I resorted to doing them at home for Loic's sisters at first, and then everyone wanted one. 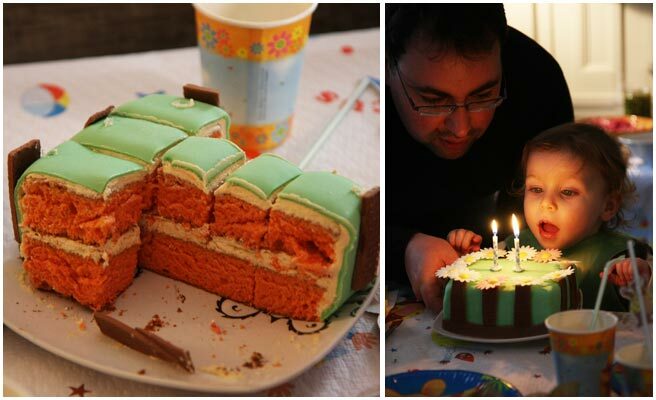 This year, the opportunity came to make special cakes for my son's first birthday and his two cousins aged 2 and 4, all having birthdays in February. I took it as a chance to learn something new. After ruling out the idea of a communal cake for the children, I decided that what I wanted for each child were the little cakes that Alice bumped into after being trapped by that magic potion in the long hallway. The cake that injected magic into her world, the one she ate trying to get into the beautiful garden. Smooth looking, colorful, silky, simple cool cakes that call out: EAT ME, and promise adventure. I have always loved the clean simple visual effect of fondant on a cake. I had no idea what kind of work it would entail. First you roll up your sleeves. Then do a little research. The more I saw, the less sure I was going to be capable of pulling it off. Fondant is sugar cooked without burning to certain candy stage, then cooled on marble, worked and stretched and kneaded to puff it up with air, stretch it, and form a kind of white paste, which is then deftly rolled out on a large greased work surface and applied with finesse (at least from what I could see in the videos addressing this technique) to a buttercream iced cake. Voila. For fondant making, you must have a slab of marble, know how not to get burned, possess all kinds of professional know how, a scraping raclette, and wear a large white toque, I think. While we do have my great grandmother’s marble top dresser, that is covered with books. And I don't have much work surface to speak of in my little city apartment. I like candymaking well enough, but I wasn’t sure I could rise to the task. The sighs and oh-wells had begun to well up and I began shooting thoughts to other ideas when I ran across an ingenious recipe created and distributed widely by industrious American moms and used to scrap together homespun “whimsy cakes” across the country to varying degrees of success. It is called MM fondant. Sounds technical, doesn’t it? It is really a very simple and delicious idea, using microwave melted Marshmallows into which you simply knead flavors, colors, and sugar to get a this silky matte dough. You can cover cakes with it, sculpt figurines or flowers, just about anything. This video had me sure I would be able to do it, and this recipe had me on my way. Why not? I decided to give it a try without Crisco which we do not have in France, and if it turned out to be horrendous, I could just toss it and stick with the buttercream. I have a special memory of my niece Awen sitting primly at the age of one and a half on a bench under the chateau’s rear portico near the kitchen door. She was in the shade from the summer sun. Her father presented her with a paper plate scattered with morsels of the summer’s best strawberries, her first taste ever. The moment engaged me quite firmly because her love for this berry was so sincere and innocent. For Awen, now that she is four, it would be a Fraise Tagada cake with vanilla Italian buttercream and strawberry scented fondant. For Emilie, my God-daughter, not long ago, there was an incident where she was given some cubes of pineapple, and she loved it so much that she began to call out for it over and over, turning it into a song about more, more “ananas” (pineapple in French). If you have ever listened to a two year old child murmuring a three syllable word like a mantra and turning it into a song, you will understand that for her, the cake would have to be pineapple. To go with salted butter caramel buttercream and pineapple scented fondant. For Ian's first birthday, he got Banana cake with chocolate buttercream. Mom's choice. For the cake, I saw a simple looking recipe called "Sponge Cake" in David Lebovitz’ Room for Dessert. It contains no butter. This seemed strange to me, but in the end it was the perfect cake, so perfect that there was no hesitation to put it right into my kitchen notebook for frequent future use. It sliced cleanly and evenly, stayed moist, didn’t shed crumbs, took to the flavors I’d added, and had a beautiful soft texture. I was very happy with it and the way it was a good foil to the buttercream. During the baby’s nap times during the week preceding the party, I took time to reflect and plan and dream about my fanciful cakes, confections that would seem to come from Wonderland. I made caramel syrup here, a batch of MM fondant with Haribo marshmallows there (which tasted pretty darn good). Two days before the party I prepared the buttercream flavors. The day before the party I rolled out the fondant and applied it to my iced cakes in very little time. When I finished the cakes, each to be sliced into twelve kid-sized dreamy cubes, I did feel like writing “EAT ME” on each one. I hid them away on a shelf in the linen closet and didn't bring them out until we sang the birthday song for each child. They were a great success with the children and adults alike. For the Buttercream, I prepared this recipe (it's big for a KitchenAid Artisan, I suggest you halve it unless you have an industrial sized mixer). - Pour sugar in a small saucepan and add the water without stirring (stirring will make it grainy). Cover and cook over high heat until sugar is boiling. (the steam will run down the sides of the pan to clean the spatters without causing graininess by covering it). - Turn off heat, and add 120g water just a little at a time an wait for the volcano action to subside after each addition. Stir and let cool, refrigerate until used. *note this recipe contains no butter. It has a light and airy consistency and is a lovely cake for birthday cakes. It is easier to slice to size for icing layers if you bake it the day before and let it sit lightly covered at room temperature overnight. - Preheat the oven to 350F/175C and position the rack to the center. Lightly butter the bottom of two 6"x9" pans. (you can bake this in one sheet if you like, or bake it in a 9" round pan too if you like). Dust the bottom of the pans with flour. - Sift together the flour, baking soda, and salt. - In a rather large bowl with an electric mixer at medium speed (I did this with the hand blender's whip), whip the egg yolks and water for 1 minute. Lower the mixer speed and add the sugar and vanilla (flavorings can wait if you are dividing this recipe for different cakes), then increase the mixer speed to high and continue beating for 5 minutes, until a ribbon forms when you lift the whip. - Once the egg yolks form a ribbon, beat the eggwhites in the mixer bowl, until they form soft drooping peaks when you life the beater. - Place the yolk mixture bowl over a damp towel on the counter to hold it in place. Incorporate the flour mixture by sifting the dry ingredients over the yolks with one hand and folding gently in with the other hand. When the flour is completely incorporated, use a rubber spatula to fold the beaten eggwhites into the flour yolk mixture. - If you are dividing this recipe in two, remove 5 cups of batter to another bowl and carefully fold in your flavorings to each part. Transfer the batter to the pans and spread it into an even layer. - Bake 15-18 minutes (for this sheet pan adaptation) or about 45 minutes if you are using a single layered 9", 3" deep cake pan. Wow, fondant you can make at home *and* it tastes good, you have a real winner there. I also love the size of your cakes. Just enough for everyone to have a little piece. What a lucky boy that Ian is. Happy Birthdy to all of the february kids! I've come to witness to just how delicious these cakes were! Kid-sized pieces indeed, they let the adults feel less guilty about having seconds and thirds! Francine, I saw you scarfing down another piece straight from the cake plate. So did my mother-in-law who mentioned it later. Just kidding! LISA dear! Your birthday's coming up soon, don't forget! Kathryn, you should try it - I was surprised at how tasty it was. Thank you Anita! I'm glad you liked it. love the photo of cake-loving child! I love your warm, congenial family occasions, and your care and preparation are a wonderful part of the whole. I think you've inspired quite a chorus of "AWWWWW!" and "Yummmm," at the cake pictures, and some of us will forget ourselves so far as to "Nom-Nom" at that sweet, happy chocolate face. These are times that every Mother dreams of, and will never forget. I loved the pics! 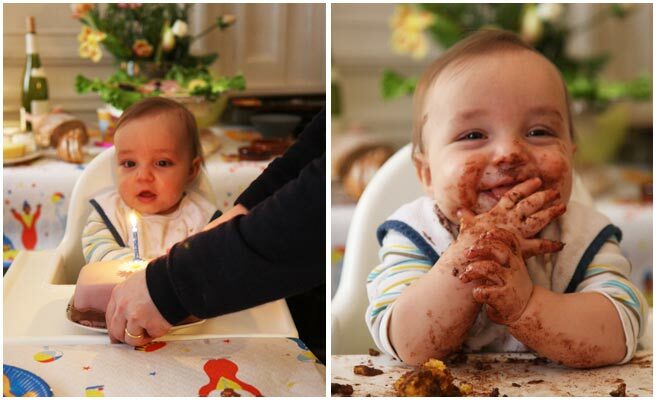 especially of adorable & messy baby Ian! Happy Birthday!!! I loved looking at pics of Lyon, such a beautiful city! I have just been to Paris three times! Love your Blog! Looking forward to keeping in touch with you! glad to be part of the party! I can't believe you made those! Those are gorgeous!! Wow, no wonder your family asks you to bake the cakes. I wish I could have had a little bite. They look delicious. Happy Birthday to little Ian btw!! Thanks, all for your comments. David, I think that recipe is going to get a lot of use around here this year. Thanks. Love the pictures and the cakes! You are a cake wizard! As to the fondant - I had no idea it was so complicated! What a wonderful solution! The last cake I made here was my mother's Devil's Food with chocolate frosting. The French neighbors found it... puzzling. Don't let that discourage you from baking birthday cakes, Katie. I have flummoxed many with my cakes over the years. Don't worry, being puzzled is a common response, also not understanding why I don't just BUY a layered fluff and butter slab and slap it on the table. But they got over it. They still think I'm a little crazy though. It's good to keep them on their toes. What lovely pictures! They turned out so beautiful! I will have to try your fondant recommendation. Thanks! I come from a family where birthday cakes are the non-decorated kind, but we can always request our favorite. Yes, clotilde, I got the edible flowers at G. Detou in Lyon, following your recommendation as a place for pastry and cake supplies. It is a great place.